The Investor Protection Clinic at Osgoode Hall Law School provides free legal advice to people who believe their investments were mishandled and who cannot afford a lawyer. Until now, Canadian investors have not had a place to go for free legal advice; the Investor Protection Clinic fills this void. The Clinic provides legal advice to people who believe they have suffered an investment loss as a result of someone else’s wrongdoing. my advisor signed forms on my behalf without my permission. representing you in a legal proceeding. However, the Clinic is unable to help you with losses that occurred as a result of market forces and risks inherent in investing. The Clinic is staffed with Osgoode Hall Law School students that are paired with supervising lawyers from law firms in Ontario. If the Clinic is able to take you on as a client, you will be paired with a student-lawyer team that will provide you with legal assistance. 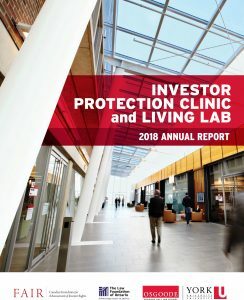 The Investor Protection Clinic also functions as a research lab, collecting data in an anonymized way that will be used for research purposes. The Clinic is funded by The Law Foundation of Ontario and has a community partnership with FAIR Canada.